Magnetic resonance imaging (MRI) has been used for many years for anatomic evaluation of the kidney. Recently developed methods attempt to go beyond anatomy to give information about the health and function of the kidneys. Several methods, including diffusion-weighted MRI, renal blood oxygen level–dependent MRI, renal MR elastography, and renal susceptibility imaging, show promise for providing unique insight into kidney function and severity of fibrosis. However, substantial limitations in accuracy and practicality limit the immediate clinical application of each method. Further development and improvement are necessary to achieve the ideal of a noninvasive image-based measure of renal fibrosis. Our brief review provides a short explanation of these emerging MRI methods and outlines the promising initial results obtained with each as well as current limitations and barriers to clinical implementation. Renal fibrosis is the common pathway of progression of CKD, characterized by the abnormal accumulation of macrophages,3 the appearance of myofibroblasts recruited to the kidney or derived from cells resident in the kidney,4 and the deposition of a fibrotic interstitial matrix, including collagen.5–7 As fibrosis increases, tubular epithelial cells lose their resorptive function, and the kidney decreases in size. Several drugs in various stages of clinical trial show encouraging potential to halt or reverse the progression of renal fibrosis.8 Assessment of renal fibrosis requires invasive kidney biopsy with nontrivial risk of serious complication.9 A noninvasive method of assessing renal fibrosis would be a valuable tool to diagnose CKD and monitor antifibrotic therapy. Toward this goal, several magnetic resonance imaging (MRI) methods are in development, which may be able to provide information about kidney fibrosis and renal function. Diffusion-weighted MRI gives information about the motion of water molecules in tissue. In diffusion-weighted imaging (DWI), a strong magnetic gradient field (called the positive diffusion gradient) causes water molecules to accumulate phase. A second gradient field, which is the negative of the first field (called the negative diffusion gradient), undoes this phase accumulation. For water molecules that have not moved in the time between the positive and negative diffusion gradients, the phase accumulation caused by the positive gradient is exactly undone by the negative gradient, and these molecules experience no net change in phase. However, water molecules that are in motion in the short time interval between the two gradients accumulate phase during the positive diffusion gradient, which is not completely undone by the negative gradient. Accumulation of phase causes signal loss. Therefore, moving water molecules give less signal (less intensity on the final image) than water molecules that are stationary. The amount of signal loss increases with increased distance traveled by water molecules in the time between the positive and negative diffusion gradients. Water molecules that diffuse freely experience the greatest signal loss, whereas molecules with motion that is constrained by surrounding structures experience less signal loss. This signal loss can be modeled to give a quantity called the apparent diffusion coefficient (ADC) for each pixel in an image that expresses how freely water is able to diffuse in the tissue. DWI can be performed rapidly with standard MRI equipment, and therefore, technical barriers to clinical implementation are low. An extension of DWI known as diffusion tensor imaging (DTI) gives additional information about the organization of tissue. 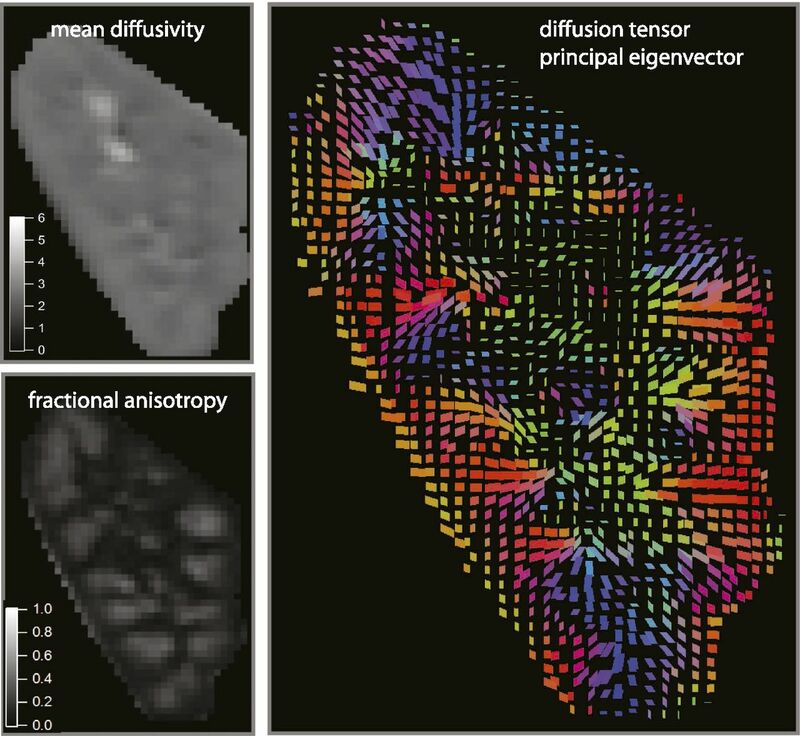 In DTI, diffusion imaging is performed repeatedly with diffusion gradients oriented in different directions. This allows quantification of not only the freedom of water molecules to diffuse (ADC) but also, the preferential directions of diffusion. For water in free solution, there is no preferential direction for diffusion; motion is random in all directions. However, in tissues with an organized structure, water may diffuse more freely in one direction than another. For instance, in the tubules of the renal medulla, water may diffuse preferentially along the direction of the tubule. The degree to which diffusion shows a preference for direction is quantified as fractional anisotropy (FA). FA measured by DTI has a range of zero to one and represents the degree of spatial organization of tissue. Renal DTI shows preferential directions of diffusion corresponding to the anatomic organization of kidney tissue. A single coronal slice from the kidney of a normal volunteer is shown. Mean diffusivity (upper left panel) is equivalent to ADC in DWI. FA (lower left panel) quantifies the extent to which diffusion occurs with a preference for direction. FA is higher in the medulla than the cortex, indicating that diffusion in the medulla tends to have a preferential direction. This direction is illustrated in the plot of the principal eigenvector (preferred direction of perfusion) shown in the right panel. In this color-coded plot of direction, red is right-left, green is anterior-posterior, and blue is superior-inferior. The eigenvector plot shows that diffusion in the medulla occurs preferentially in a radial direction from the center of the kidney toward the periphery. Images courtesy of Eric Sigmund. Modified from ref. 26, with permission. Renal BOLD T2* map shows higher blood oxygenation levels in the cortex than medulla. T2* maps and source images from a normal volunteer in three planes from a full three-dimensional dataset are shown. The images were acquired with a free-breathing prospectively navigated method,58 with a total scan time of 5 minutes and 13 seconds. T2* is higher in the cortex than the medulla, reflecting higher levels of blood oxygenation in the cortex. Magnetic resonance (MR) elastography is a method of quantifying tissue stiffness with MRI.49 In this method, a mechanical transducer is placed against the body surface and causes mechanical vibration that propagates through the tissue. MRI is performed in synchrony with the mechanical vibration. MRI phase images can detect small displacements of tissue throughout the imaging volume. These displacement maps can then be used to calculate the stiffness of tissue throughout the imaging volume (Figure 3). Renal MRI elastography measures the stiffness of the kidney. A map of stiffness over a single coronal slice of the kidney of a normal volunteer is shown. Images courtesy of Richard Ehman. Magnetic susceptibility is a physical property of tissue that varies slightly between different tissue types and has a complex effect on MR images. For example, susceptibility-weighted imaging is useful for depicting small veins in and around the brain. The potential of susceptibility-weighted imaging in the kidney is unclear, but one study suggests that water loading causes changes in MRI phase images of the medulla of human kidneys.55 Sophisticated mathematical analysis of MRI phase images can go beyond susceptibility weighting to yield quantitative maps of estimated tissue susceptibility. In a study of mice with deficient angiotensin receptor type 1 (AT1), significant differences in susceptibility were seen between wild-type mice and mice with AT1 deficiency.56 Because AT1 deficiency leads to renal disease, including fibrosis, it was hypothesized that susceptibility changes in diseased kidneys represented the effect of accumulating collagen and other proteins. However, gadolinium contrast agent was used in this study to shorten imaging time, which itself strongly affects susceptibility, and it is possible that the observed differences in susceptibility could be related to changes in the kidney other than or in addition to fibrosis that affect gadolinium distribution. 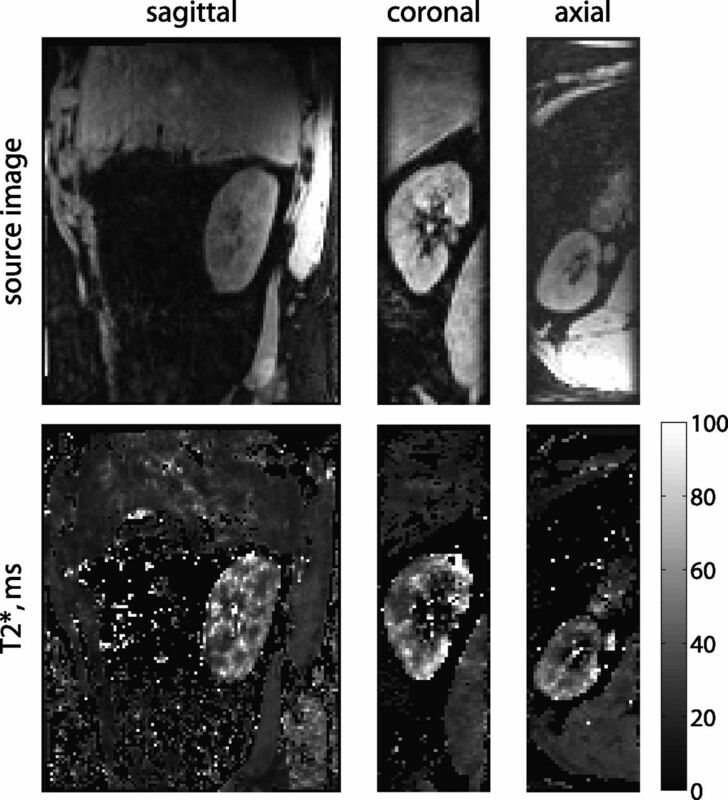 An extension of susceptibility imaging known as susceptibility tensor imaging has been applied to excised and fixed rat kidneys and has shown the intriguing potential to provide information about renal tissue microstructure on the scale of the renal tubule that may be relevant to renal fibrosis.57 However, this method is limited to ex vivo imaging and is not currently feasible for human imaging, because it requires extremely long imaging times and also requires that the tissue be placed in a variety of orientations relative to the main magnetic field of the MRI machine, which is not possible for human subjects in a conventional toroidal MRI system. MRI has been used for many years to depict the anatomy of the kidney. Newer MRI methods aim to move beyond anatomic imaging to provide information about fibrosis and kidney function. DWI, renal BOLD, renal elastography, and renal susceptibility imaging are MRI methods that may be useful for evaluating renal fibrosis, but each still requires further development and validation. DWI, the most extensively studied method, has the advantages of being fast and simple to perform with existing MRI hardware. The limited accuracy of this technique for evaluation of renal fibrosis may be improved by better standardization of protocols and routine incorporation of more sophisticated models to differentiate tubular, vascular, and fibrosis contributions to changes in diffusion parameters. Many confounding factors have led to contradictory published renal BOLD MRI results so far. 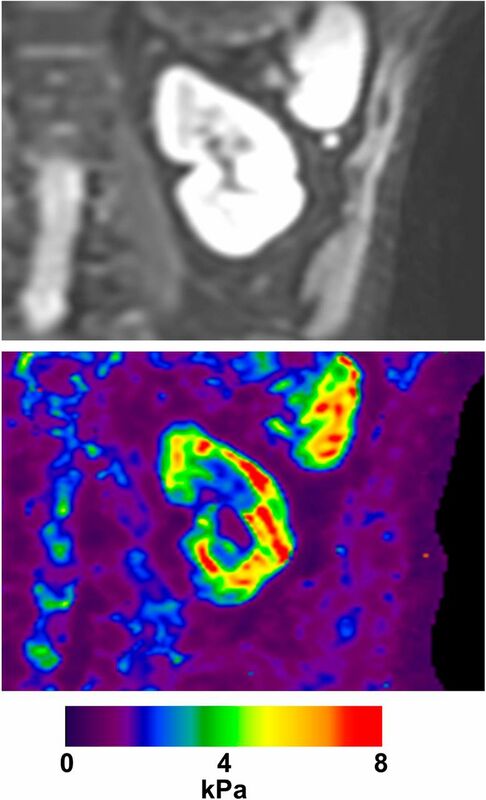 Efforts to advance BOLD MRI are motivated by the compelling promise of noninvasive measurement of renal oxygen levels. MR elastography directly measures the stiffness of the kidney, potentially a measure of fibrosis, but is also confounded by other variables, such as renal blood flow and water content. Modeling these factors to tease out the component of kidney stiffness due to fibrosis may improve the usefulness of elastography. Finally, susceptibility imaging offers intriguing information about the microscopic structure of the kidney but is currently only feasible ex vivo. Presently, no MRI method offers a clinically useful evaluation of renal fibrosis, but these methods are on the near-horizon. Experimental data so far show promising correlations between MR results and renal fibrosis and function, which encourage us to continue development and improvement of MRI kidney imaging methods for the evaluation of renal fibrosis. The authors acknowledge support from the National Institute of Health grant (R01DK063183-06).